No doubt you have seen people get on the podium and walk up to the lectern toting a bottle of water. While there is no question that Mark Rubio's water bottle moment will be etched in our minds forever. Yet when seeing people carrying a bottle of water with them, it has to be that they do not know about a simple trick that allows us to carry the water inside us so that we don't have to carry it with us. It will prevent dry mouth and keep the vocal cords properly hydrated. Bring Your Water In You, Not With You! In order to get water to the cellular level of our body, we need electrolytes. In other words, we need salt dissolved on our tongue when we drink our water to get the best benefit from the water. Note: The following should not be used by those with certain medical conditions. Taking more salt and or water could cause serious health complications. You should not use this without working with your doctor or working with an experienced naturopathic doctor. Those who should not use it include those in kidney failure, congestive heart failure, and those with the rare genetics who do not tolerate extra salt. In almost 2 decades of nursing, I nursed one such person who had the genetic abnormality. Saying she was allergic to salt, on starting the doctor ordered saline IV, her arm developed red streaks. This happened years prior to knowing about the genotypes that do not tolerate extra salt. Here's how to do voice care hydration. Drink Water: We need about 10% our body weight in ounces of water each time we drink. We need this amount about 5 times a day. However, most will not drink this much. So, the best start is drinking the first thing in the AM and last thing before bed (preferably 30-45 before bed). Do not consume more than 32 ounces in any 2 hour period and take salt every time you drink the water. Yes, every time you drink water, take the salt unless you are avoiding the salt for a specific health reason. Consume the water 30 minutes before meals and 2 1/2 hours after you have completed your meal. While most professional speakers do not eat before speeches, timing the water intake is not a problem. There is also a metric protocol for those who use liters and not ounces...(http://www.watercures.org/metric-water-cures-protocol.html). You can drink anytime within an hour of your speech but 45 minutes is optimal. This is the minimum time it takes to get the water into your blood so your body can distribute it to where it can provide the best results. How Much Salt: The salt you take should be at a ratio of 1/8th tsp for every 16 ounces of water. The salt should go on or under your tongue every time you drink. I repeat, take the salt every time you drink the water, unless you are avoiding the salt for a specific health reason discussed by your doctor. Too much water without salt can be deadly. Note: For optimal hydration voice care, you will want to start this protocol long before your speaking date. For some reason, even when people repeat the directions back, they fail to put the salt on their tongue and then call and say they got sick from the salt in the water. With two exceptions, nobody has ever had a problem by putting the salt in the mouth and letting it dissolve and then drinking the water. While problems are very rare out of the thousands the Water Cures Protocol has helped, test this before you give a speech so your body to adjust to the new hydration protocols. Bathroom Visit Frequency Increase: Rarely, some, even with the salt, will have to visit the bathroom more often at the start of the protocol. If you cannot hold your water for at least 2 hours and up to 4 hours, then you need sugar. You can get this sugar and minerals with a bagel or a baked potato. This will help you to retain the water. In an emergency and if these are not available, a teaspoon of sugar or honey should help you hold your water. After your body gets acclimated, you will soon not have this problem. Some can hold their water for up to 4 hours in the day time and 8 hours over night. Lightheartedness: There was a report of one person who experienced lightheartedness. We surmise that this was due to the person being on a low salt diet for a prolonged time. To end the lightheartedness, the person placed an ice pack on the side of the neck until it could not be tolerated any longer then they switch to the other side. They hold it there until they could not stand it. The process was repeated again and things came back to normal. Also, start with less salt and build up to the amount your body needs. Burning Sensation When Eating the Salt: Again, this is due to low salt consumption. Start off with less salt and slowly build up to the amount your body needs. No question about it, we need our mouth and vocal cords hydrated for when we speak. Yet most people do this entirely wrong when trying to provide hydration voice care. They do not know how the body works and a simple solution to the hydration challenge to make make hydrating our mouth and voice box more effective. As a matter of fact, there are a number of myths regarding this and some come from doctors who are not experts on hydration. Myth: All liquids hydrate us. Truth: Aside from the obvious, alcohol which has a dehydrating effect without a doubt, most doctors do not realize that sugary drinks are among the worst things we can drink before a speech (or any time for that matter). While sugar can help us to retain water, it does it at a cost. That cost is a decrease in the quality of thinking, memory and most importantly, how our body uses water. Caffeinated drinks as well as carbonated drinks can cause your voice to crack as well as the excess gas that could come up at the most inopportune time. What about caffeine? While it has a number of great health benefits, it can lead to other voice problems. If you do drink, wait till after the talk and use it as a reward rather than a a crutch to help you do better. Adding sugar or creme to the coffee makes it worse. When water has sugar or any other substance other than perhaps the liquid part of a lemon without the pulp, it reads the water as food. If water is consumed with food, it further dilutes the stomach acids and decreases the ability for the stomach to adequately digest the food. Also, the water is thought by the body to be a food and in it has to go the long way to be re-purposed for hydration. Our bodies are wonderful when it comes to moving water from one place to another. When it comes to hydrating voice care, our bodies cannot send water to our mouth and vocal cords if it is short. Any water we drink while we are talking will need to travel through the stomach and into the gut before the majority could be absorbed. Myth: Dry mouth is a good indicator of the need to hydrate. Truth: Dry mouth is a late indicator for your need to hydrate. Even worse, as we age, the ability to tell when we are thirsty diminishes. And because our body can shift water to where it is needed on demand, your dry mouth will disappear if you start thinking of your favorite food or even start to smell it being prepared. Myth: Drinking water hydrates us. Truth: Actually water is a diuretic. In other words, when we drink water, it causes us to lose more water and minerals like salt, which helps hold the water in us. This brings up the issue about using more salt in our diet. Myth: Salt Causes High Blood Pressure. Truth: While there is a lot of confusion on this, actually, in the US, we are consuming less salt than people did after WWII. The research shows a correlation of increased heart disease that has resulted. According to research (more on this later), there are no studies that show decreased salt lowers blood pressure. The evidence shows the exact opposite. Remember Mark Twain who once said, "There are three kinds of liars. Liars, dam liars and statisticians." This is because it is possible to make statistics say what ever you want. The anti-salt campaign is because of using statistics to find the result that was wanted rather than finding out the truth. The anti-salt mind set was bad for the salt industry and great for the pharmaceutical industry. This created a need to resolve high blood pressure that was caused either by too much processed sugar or a lack of potassium and sodium. Who would have thought that we were not lacking in sodium and minerals, rather we simply lacking in unnatural pharmaceutical chemicals in order to have better health? How in the world did people survive the thousands of years up until now without blood pressure drugs? Water alone can act as a diuretic. When consuming just water, it can cause us to loose water. With the water loss, some salt is also lost. This is the salt that helps the water stay inside us. Is less water is better if you are going to be in front of an audience? While seeming like common sense, there are only a few things worse than not hydrating before a talk. The more we are dehydrated, the worse our brain works. Research has found that just 2% dehydration can decrease your mental abilities to such a point that you would be considered legally impaired by alcohol. 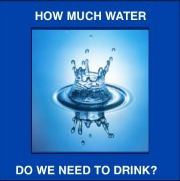 We not only need water to avoid dry mouth, we also need it to keep our brains and mental abilities at peak performance. So hydration is not just voice care, it is also brain care. There is more going on inside our water works than we are aware of. The late Dr. Batmanghelidj said there are two bodies of water within us. One ocean outside the cells and one ocean inside the cells in our body. The water surrounding most of our hundred trillion cells is kept there by sodium. The water that is inside the cells is kept t by potassium. What happens when we don't have enough dietary sodium and potassium? We have dis-ease. With the exception of certain pharmaceuticals that get rid of excess water and those facing certain diseases, most of us can handle extra salt. This is especially true if we use the right kind of salt. But what about the doctors say we should avoid salt? Actually not all docs say we need less salt. More and more doctors are realizing that salt is essential to optimal health. Consider what one top Doctor has to say about salt. According to Michael Alderman, MD, Professor of Epidemiology and Population Health and of Medicine at Albert Einstein College of Medicine. In one of his interviews he said that while there are clinical trials over 3 decades proving medications lower blood pressure, there are none proving low sodium diets reduce blood pressure. Not one. The studies hypothesize the findings. He said, "The effect of reducing sodium has very little benefit." The reason the studies were not conclusive, the various body sizes and numerous other factors were not taken into consideration. What about the studies showing salt raises blood pressure? Those studies are flawed. This can be seen by looking at studies that looked at other reasons for high blood pressure. Research found that it is not salt (with the possible exception of table salt which has been stripped of the trace minerals we need) that causes high blood pressure. Studies have found both magnesium and potassium can help normalize blood pressure. With a web search of either term and you see many top health websites sharing the research of how these two necessary minerals lower blood pressure. Instead of too much sodium, your magnesium or potassium may be out of balance. The best way to get these minerals is through diet and not by supplements. For that matter, we would highly suggest not using these supplements without consulting your doctor first as they can cause serious health problems. Eating foods contain these minerals do not pose this harm. Research also shows that refined sugars can cause high blood pressure. Do web research sugar and blood pressure. Salt may not be your high blood pressure cause, it may be carbohydrates as they cause you to hold more water. With more water in our bodies (and in our blood), the pressure in our blood vessels increase. Sugar is probably worse for raising blood pressure than salt according to the research. Note what the American Journal of Hypertension says about the relationship of nutrition and high blood pressure. The best salt for improving health is natural salt. Just because a salt is labeled as sea salt, does not mean it has all the original minerals within. The mined salt usually has all the trace minerals. The companies that pride their processes will list the various minerals of their salts. Unprocessed means that various trace minerals have not been stripped from it. This is what table salt is guilty of and why it is not good for optimal health. The best known salts include (in alphabetical order) Celtic, Himalayan, Real Salt (from Utah). We do not recommend any particular salt. I do not have financial connections to these companies and constantly try various salts. You might say I am a salt-aholic.